Can someone please explain to me the origins of this text published by Rangjung Yeshe in Precious songs of Awakening. Here is a translation from the original Oddiyana language by Longchenpa to Tibetan and then to English by David Christensen. Chogyal Namkhai Norbu Rinpoche has written a very interesting book on this song, but it is restricted. It is closely connected to his Longsal teachings. Traditionally it seems to be mainly sung during tsog. 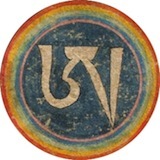 That's song of the vajra. Of course it it , I'm a bit thick sometimes!